How does an entrepreneur identify what customers will buy before the products or services exist? To answer that question, it helps to address another question first: Why does anybody buy anything? We list pain and pleasure in that order for a reason. All things being equal, the more acute the pain or problem, the more likely it is that you’ll be able to offer a compelling solution. The more compelling the solution, the more quickly the customer will pay. From an entrepreneur’s perspective this means that it’s often better to be in a “pain business” than a “pleasure business.” There is simply more staying power in pain-solving businesses. In fact, entrepreneurs often wind up using “customer pain” as a synonym for “customer needs” or “customer problems.” At times this can seem a bit over the top, even cynical, as we talk about soothing the customer’s pain by selling him an electric gadget or a new style of clothing. But referring to pain rather than needs or preferences reinforces the point: Customers are people. They appreciate the world through the prism of their experiences. They sense what challenges or bothers them–their pain–but they often can’t even conceive of the solutions–their needs. So, look for the pain. Think of things that people find disturbing, frustrating, urgent or uncomfortable. Then, with the pain clearly recognized and in mind, switch gears and develop cures. Focus on healing. Let that be your guide as you try to invent a venture that will make the pain go away. There is one more component here. You want to focus not just on identifying what the pain is, but also figuring out when people feel it most pressingly. It’s almost always easier to sell a solution to a current, intense pain than to solve something less acute. If you’ve ever had to call a locksmith or a plumber in an emergency, you’ll understand this point almost intuitively. It’s easier to sell somebody a new car when he or she has just learned that the faithful old clunker will need a $1,500 repair job. It’s easier to sell aspirin than vitamins. Human as this desire to end pain is, the quest applies to business customers, too. Businesses generally strive to do two things: increase sales and cut costs. So, if you can demonstrate new ways that business customers can find new markets, create new products, or even raise prices on existing products, you can solve their pain by helping to increase revenue. If you can offer business customers innovative new ways to manage their workforces, comply with government regulations or build infrastructure, you can solve their pain by helping to cut costs. One final thing to consider: the customer and the end user are not necessarily the same person. If you sell games and toys for example, often your users might be children, but the customers who actually buy your products are probably their parents. Likewise, if you run an Internet search on Google, you’re Google’s user, but it’s only when you purchase Google AdWords that you become Google’s customer. There’s a simple method for figuring out whether your new venture idea will address a real customer pain. It comes down to this: Can you describe the pain your company solves–and why anyone should care–in just a few words? Can you then persuade a prospective customer to purchase your product using your simple explanation? If so, congratulations. You’re miles ahead of most entrepreneurs. Innovators and founders who need paragraphs to describe their market or persuade potential customers demonstrate that they haven’t refined their businesses sufficiently. This works in reverse as well. Think of the some of the most successful companies in the world and also of some of the companies we’ve used as examples already. For the truly great ones, you can probably describe very quickly what they do and thus what customer pain they exist to solve. Apple exists because people want elegant technology. Google exists because advertisers want to reach customers effectively. Starbucks exists because people are addicted to caffeine. Many customer needs are for things the customers themselves don’t fully understand or articulate. Why buy an iPod instead of a less expensive MP3 player? Why drive a Lexus instead of a Toyota? Why pick one brand of artificially sweetened carbonated beverage over another one? Usually the answers to these questions have less to do with features than with image, feelings and intangibles. Clothing retailer Abercrombie and Fitch generated revenue of about $3.5 billion in 2010. The company has its roots in a 100-year-old sporting goods store. What sets it apart from its competitors so that they can charge a huge premium for their clothes? The answer is that they don’t sell clothes as much as a lifestyle and a promise. Walk by the store, and you’ll see massive posters of beautiful, scantily clothed young people, reinforcing an image. All this time you thought you needed diet and exercise to look great? They’re driving home the message that what you really need is a pair of $120 jeans and a $70 t-shirt. It’s easy to become a cynic when we look at intangible needs as part of customer pain. Sure, some intangible needs can seem silly, but many others are legitimate, even vital. Sometimes as an entrepreneur, these are the most intense kinds of pain you can address. The process of creative destruction often leads to the creation of new customer pain. For example, nobody needed an auto mechanic until entrepreneurs started building cars. Nobody needed identity theft protection or credit monitoring until entrepreneurs created the personal credit report to address problems in lending and borrowing money. Apple first unveiled the iPod during the heyday of Napster, when people could share songs with each other for free via the Internet. Yet, consumers’ widespread adoption of the product confirmed for Apple a new, unmet need: Customers wanted to be able to get music quickly, easily, relatively cheaply, and perhaps most important, legally. The result was iTunes, which grew into one of Apple’s most successful products. At the same time, Apple designed the iPod so that it could be used only with headphones (earbuds, in the company’s nomenclature). Thus, users had a great new way to transport and play music but no way to play it loud enough to share. Users developed new pain and many other companies developed complementary products like external speakers and docking stations. So, pay attention to trends and innovations, but don’t be like the hordes of other would-be entrepreneurs who rush to market with “me-too” products. Look instead for the new pain each entrepreneur causes, even as he provides a solution to something else. You’re almost guaranteed to find something. Customer pain is the ultimate renewable resource. 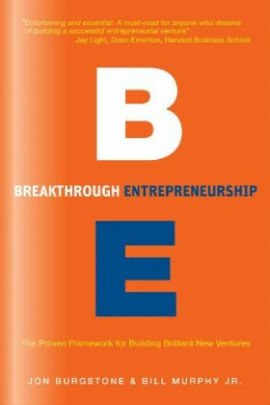 From Breakthrough Entrepreneurship by Jon Burgstone and Bill Murphy, Jr. Copyright © 2011-2012 by Jon Burgstone and Bill Murphy, Jr. Reprinted by permission of Farallon Publishing.